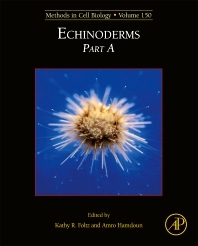 Echinoderms, Volume 150 in the Methods in Cell Biology series, highlights new advances in the field, with this update presenting interesting chapters on procuring animals and culturing of eggs and embryos, cryopreservation of sea urchin gametes, emerging echinoderm models, culturing of sand dollars, cidaroids and heart urchins, culturing echinoderm larvae through metamorphosis, microinjection methods, injection of exogenous messages and protein overexpression, blastomere transplantation, visualization of embryonic polarity, larval immune cell approaches, methods for analysis of sea urchin primordial germ cells, and protocols and best practices for toxicology and pH studies using echinoderms and　several new chapters outlining the use of sea urchins in the classroom. Kathy Foltz is a Professor in the Department of Molecular, Cellular and Developmental Biology at the University of California, Santa Barbara. She came to UCSB after her Postdoctoral work at SUNY- Stony Brook with William Lennarz following her PhD work at Purdue University with David Asai. A Searle Scholar, NSF Presidential Faculty Fellow and AAAS Fellow, she has used sea urchins, sea stars and other invertebrate deuterostomes to investigate questions of gamete recognition, egg activation and control of cell division throughout her career. She enjoys sharing her curiosity and knowledge with many undergraduates, graduate students and postdoctoral research colleagues. With the UCSB Marine Lab located on the main campus, over 1,000 undergraduate students have also worked with these fascinating organisms under her guidance in the Developmental Biology Laboratory classroom. Amro Hamdoun is an Associate Professor in the Scripps Institution of Oceanography of the University of California, San Diego. His research bridges developmental biology and environmental toxicology, with a focus on the roles of xenobiotic transporters in the embryo. His research merges biochemical, cellular and structural approaches with high-resolution live imaging of echinoderm development. This work has been featured on the covers of Development, Developmental Dynamics, Molecular Biology of the Cell and Molecular Reproduction and Development. The Hamdoun laboratory is also a leading contributor of reagents for the sea urchin through Addgene (https://www.addgene.org/Amro_Hamdoun/). He was a recipient of the NIH Ruth L. Kirschstein NRSA and Pathway to Independence fellowships, and the Scripps Institution of Oceanography Outstanding Undergraduate Teaching Award.